Custom Trail Blazers playoff t-shirts and PixMob light bracelets on every seat Never before seen video introductions of the Trail Blazers Photo opportunities and meet and greet sessions with members of the BlazerDancers and Trail Blazers Stunt Team A 20-foot Moda Health signing wall for Rip City fans to autograph and wish good luck to the team A life-size Damian Lillard bobblehead statue located in Kid City courtesy of Biofreeze New NBA Playoff merchandise and retail items in Rip City Clothing Co. Basketball activities on the 300-level concourse engaging kids and getting them excited for summer basketball programs with the Trail Blazers Youth Coaches And more! DIVERSITY, EQUITY AND INCLUSION STATEMENT Rip City brings people together to create lasting memories through the power of sports and entertainment. Our organization has an opportunity and responsibility to positively impact our staff, players, fans, and community. As such, we are committed to advancing diversity, equity, and inclusion within our organization and our community, which includes: • Providing a safe and welcoming environment that champions differences and embraces the respectful open expression of ideas that are free from hateful, racist, profane, violent or harassing behaviors or comments. • Ensuring that our policies, practices and programs consider and seek to address societal inequities that disproportionately impact specific groups. • Utilizing our platform and resources to positively impact people throughout our community who have been underserved. • Cultivating a staff that reflects the community we serve and an inclusive culture where multiple perspectives are valued. We ask that you join us in this journey, and that you continue to advance this work within your own sphere of influence. We are all in this together—after all, we are all part of Rip City. 16 ANSWERS: 1. The first C in CJ McCollum's last name is capitalized, 2. The Nike swoosh on Damian Lillard's shorts are missing, 3. The NBA logo on Nurkić's back is missing, 4. Lakers #1 is missing his number, 5. He is also missing his right arm. Can you find all five? PORTLAND (53-29)	LILLARD	MCCOLLUM	NURKIĆ	KANTER*	HOOD*	AMINU	CURRY	HARKLESS	LAYMAN	TURNER	COLLINS	LEONARD	SIMONS	LABISSIERE*	TRENT JR.
Autism is the fastest growing developmental disability in Oregon. If you haven't already, you will meet someone with autism. The Autism Society of Oregon provides free resources, education, advocacy and support to everyone in the state who is affected by autism. It is the only nonprofit that focuses solely on autism in Oregon. People on the autism spectrum want to lead fulfilling, meaningful lives. Together, we can make that happen. Learn more at AutismSocietyOregon.org. AT SERVICEMASTER BUILDING SERVICES OUR PEOPLE MAKE THE DIFFERENCE WE'RE COMMITTED Our dedicated service pros arrive highly trained and, even better, 100% committed. YOU'RE SAFE Your facility and valuable assets are secure; as Green Clean Partners to the Portland Trail Blazers and the Moda Center at the Rose Quarter, our commitment to your business and to providing sustainable cleaning initiatives is unmatched. YOU'VE CHOSEN THE BEST We're hard at work across the Metro area, cleaning over 12 million square feet nightly and serving leaders like Comcast, Providence Health Systems and the Portland Trail Blazers. WWW.TRAILBLAZERS.COM/POSTERS HURRY, AUCTION ENDS APRIL 19! ALL PROCEEDS BENEFIT THE TRAIL BLAZERS FOUNDATION, POSITIVELY IMPACTING THE LIVES OF CHILDREN AND FAMILIES WHO HAVE BEEN HISTORICALLY UNDERSERVED, WHERE THEY LIVE, LEARN, AND PLAY. Check out the new Made by Her line at Rip City Clothing Co! We’ve partnered with women-owned businesses on unique collaborations – locally designed for Rip City. This month’s featured item is a bag by Torrain. Supplies are limited, so be sure to stop by Rip City Clothing Co. tonight or shop Tuesday-Saturday from 11am-4pm! 50% TO ONE LUCKY FAN 50% TO THE TRAIL BLAZERS FOUNDATION The Trail Blazers Foundation supports nonprofits, schools and youth. Purchase your raffle tickets at the Trail Blazers Foundation 5050 Raffle kiosks located on the 100 and 300 level concourse or look for the mobile sellers in yellow aprons. The Rip City Academy in partnership with Nike is a community-driven program designed to partner youth basketball leagues around Oregon and Washington with the Portland Trail Blazers to help provide kids the opportunity to grow their love of the sport and have a positive early experience playing basketball. AMAZONSMILE The Trail Blazers Foundation participates in the AmazonSmile program. Register at smile.amazon.com to have a portion of your purchases donated to the Trail Blazers Foundation! Â©2018 The Coca-Cola Company. All Rights Reserved. If this is your first Trail Blazers game at the Moda Center, please visit our My First Game booths on the 100 level (ENTRY A7), 300 level (ENTRY C33) and Kid City (ENTRY C14) before the end of the 3rd Quarter to receive your “MY 1ST GAME” BUTTON and OFFICIAL CERTIFICATE. Welcome to the game! REMEMBER TO USE HASHTAG #1STBLAZERSGAME WHEN POSTING ON SOCIAL MEDIA! ON YOUR MARK... GET SET... GO RIP CITY! Attention runners and walkers â&#x20AC;&#x201C; register now for the 21st Annual Rip City Race for the Roses benefiting Albertina Kerr on April 28th. Beginning from the Rose Quarter, the event includes a half marathon, 10K, 5K and 1K kid and family run/walk. Every racer receives an official t-shirt and finisher medal. Plus, enjoy mimosas and some Trail Blazers fun at the finish line. L O C A T E D Great O NCause,T Great H E Race! 100 LEVEL BONUS A DEAL: C R Use O Spromo S code F RRIPCITYRUNNER O M E N forT R10%YoffAregistration! 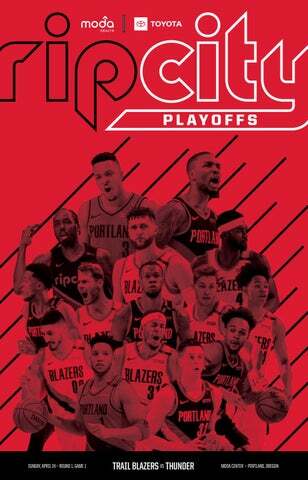 19 SHOW LOVE FOR THE SQUAD AND PUT YOUR TEAM PRIDE ON D I S P L A Y WRegister I T H E X Cnow: L U S I RipCityRaceForTheRoses.org VE NIKE JERSEYS, APPAREL AND GEAR. The Trail Blazers and KinderCare Education are committed to encouraging and celebrating reading so that all children reach important literacy benchmarks. Visit www.nba.com/blazers/readbig for more information on Read Big! BOOKS FOR POINTS For every point scored during home wins this season, KinderCare Education and the Trail Blazers will donate ONE BOOK to Reach Out and Read at Doernbecher. RIP CITY TRAIL BLAZERS GAME PROGRAM Published for each home game by Trail Blazers, Inc., One Center Court Drive Suite 200, Portland, Oregon 97227. © 2015 Portland Trail Blazers. Reproduction of this publicaion in whole or part without written permission is prohibited. Rip City Trail Blazers Game Program is produced by Trail Blazers Inc. Trail Blazers Inc. assumes no responsibility for return of unsolicited manuscripts art or photographs.